I would have tried this earlier but simply didn't know about triops existence until recently and, to me, they look like the best invention since the mogway! So first, a short description for the late discoverers like me: the triops are small prehistoric crustaceans whose eggs can dry and stays viable for many years. They hatch in temporary water pools formed by rain, generally under warm climates. Their short life (around 3 months) is spent at eating almost anything small enough for them (including their siblings), and laying eggs. When they die of old age or because the pool dried, the eggs are waiting there, ready for the next shower. I thought of them to add some originality into my Orca TL-450 aquarium (fresh water set). The star of the tank, a superb small red crab, trapped himself in one of the filter chambers and could not climb it back. 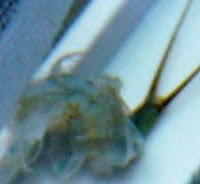 The triops longicaudatus seemed to be good candidates for the succession so I bought a small "all-in-one" sachet on eBay. However, while the sellers advertise them by saying "just add water", this is not enough to succeed, far from that! - the water must be pure (distilled or bottled water). Tap water could be too chemical (Chlorine kills triops), some bottled water may contain chlorine too, so check for Cl in the composition. - the eggs have better chances to hatch in a small quantity of water: 1 litre maximum. Of course, triop eggs cannot just be dropped into an established aquarium: the water is not pure enough for them to hatch (Being eaten by fishes is not an issue for the eggs, they can survive that kind of journey). But still, where else can I find such a convenient nursery with controlled temperature and light ? So I took a 750ml plastic food container, filled it with 500ml of Volvic, and placed it inside the Orca TL-450 tank, blocked between the top border and a big magnetic cleaner underneath. With the water at right temperature and the the provided conditioner tea bag dipping for a few hours (punched of a few holes as directed by the notice) , I poured the almost invisible eggs from their little plastic box into the aquarium. The following is a diary of their first days of life. This is not a proven method, just my experiment trying to raise triops the most maintenance-effective way. Day 1: The ever optimistic notice says it takes between 18 and 30 hours, but my triops decided that the conditions were met about 2 days later. Not many of them showed up, just three. Either the conditions are not perfect or there were just not many viable eggs in this batch. Day 2: there's still 3 triops and at least two of them are very active and growing. I've added 2 crushed food pellets in the container. They're so tiny it takes ages to eventually spot them. Day 3: I can see clearly the anatomy of the two bigger ones, no trace of the smaller one...They actively feed from the bottom of the tea bag. The water is getting dirty but I must refrain from changing it. I may accidentally "throw out the babies with the bath water"
Day 4: two vigorous triops are roaming the container. No need to search for them, they're now really visible and very active. No food given. Day 5: still two of them, one is a bit bigger than the second...for the moment they even look like good friends, but it's a very relative concept for triops. I gave some baby fish food (kind of powder) and it's a delicate operation not to overfeed them. Day 6: I undertook a risky operation to seriously recycle the water. I managed to transfer them into a second container with clean water at good temperature. Hopefully enough water from the old container was transferred with the triops so they won't be too stressed. Day 7: They're still alive and shed their exoskeleton. This molting process is supposed to repeat several times during their life. I now give them a bit of food daily. Day 8: Now they can eat un-crushed pellets of triop food.When they find one, they grab it and go everywhere with it for a while. I've added water from the main tank to prepare them for their transfer sometime next week when they'll be big enough to swim with the fishes. Next thing will be to let one of them go in the main aquarium, they'll soon be big enough. Day 10: I've transferred them into a fish breeder that would share the water of the tank while protecting them from the hungry fishes. I've assisted to the molting of the bigger one. Shortly after, he made a snack of his little brother. It happened when I was away and took only a few minutes! I released the last triop in the aquarium, thinking he was big and fast enough to survive with the fishes. He looked okay at first but disappeared a few hours later. I never retrieved any trace of him. - the most obvious was the last one: releasing the last triop in the wild too early. - another, that maybe led to the spontaneous cannibalism was to transfer them together into that breeder. I believe that this sudden change stressed them and expedited the fate of the weakest. - have a bed of clean sand or fine gravel in their nursery box. If I manage to keep them that far, that would be convenient for them to lay their eggs in it. - don't release any of them in the main tank before they lay eggs. 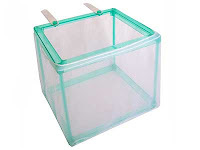 - have a rigid plastic breeder to separate them if needed. - think of a solution to have an area with sand floor in the main tank. I read that triops love to dig, and the gravel in my aquarium is too thick. This made great reading thanks. Our Triop eggs were bought in a set for a child. It consisted of a flimsy plastic container with a smaller "nursery" section, a small bag of sand, a small bag of gravel and some food. My Son received this set as a Christmas gift more than 2 years ago and we waited until spring to start things off as suggested in the instructions and...... nothing! Luckily we'd only used half the packet of eggs so had more left to try another day. So 2 years on and I was about to store our unused fish tank when I had a brainstorm. I put an empty bucket in the garden and waited for the heavens to open - and they did :) I used the rain water to fill the fish tank an left it on a window sill for a day to reach room temperature. Once I was happy the water was warm enough I poured in the sachet which contained some kind of debris, the eggs were in with the debris and after 24 hours there were obvious signs of life with little white dots flitting around. I have been feeding them 2 crushed fish food pellets per day an this seems to be too much as it doesn't all get eaten. We're now on day 4 and I can't believe how fast these things grow!! We seem to have successfully hatched at least ten Triops. The water is really dirty already and although it looks unsightly I've read that it won't harm them so I can live with that. I was hoping to add the Triops to my Platy tank once they were fully grown but the tap water in there would be harmful to them so perhaps I'll just leave them as they are. Hi, yes the water must really be free from chemical, that's the most important factor with the temperature. I'm about to try it again with sand that I kept from the first generation. Hopefully they layed eggs in it...or not, will see!